Synergistic blend for enhanced biocidal activity. All round hotel washroom maintainer. Cleans and sanitises all surfaces. Kills odour producing bacteria, - B.S. 6471 tested to Q.A.P. 50 Leaves a fresh peach fragrance. Environment friendly - phosphate free and fully biodegradable. 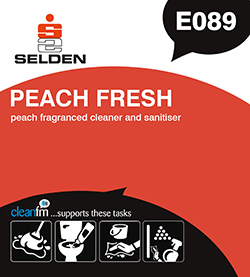 Peach Fresh is one of a range of perfume co-ordinated quality washroom products. Peach Fresh is specially formulated to clean and sanitise tiles, painted surfaces, stainless steel, and non-porous surfaces in washrooms, bathrooms, ladies powder rooms etc. Perfect for hotels, offices and commercial premises wherever a high standard of cleanliness is required. Dilute Peach Fresh 1 part to 40 parts warm or cold water for cleaning walls, floors etc. Apply neat by cloth to remove scale, bodyfats etc. around shower areas and sinks then rinse off with clean water. Maintain the same fragrant theme with matching products from our Peach range.